Mosquito control operations rely on surveillance. 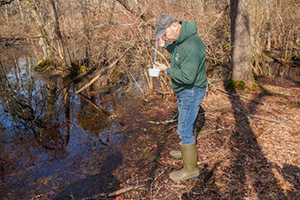 Mosquito larvae must be present for a larvicide to be applied. Similarly, the presence of biting adult mosquitoes must be verified before adulticiding operations can be undertaken. Surveillance includes regular inspections of known breeding sites throughout the season, as well as monitoring light traps to determine adult mosquito populations at select locations throughout the County.